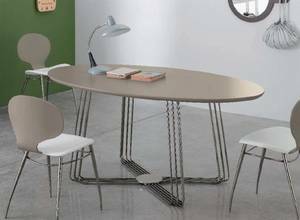 Description Oval dining table with an interesting base made up of steel tubes, available chromed or with a gun metal finish. The top can be matt lacquered wood or lacquered glass, see corresponding colour charts below for all options. Also available with a round top, see related products below.